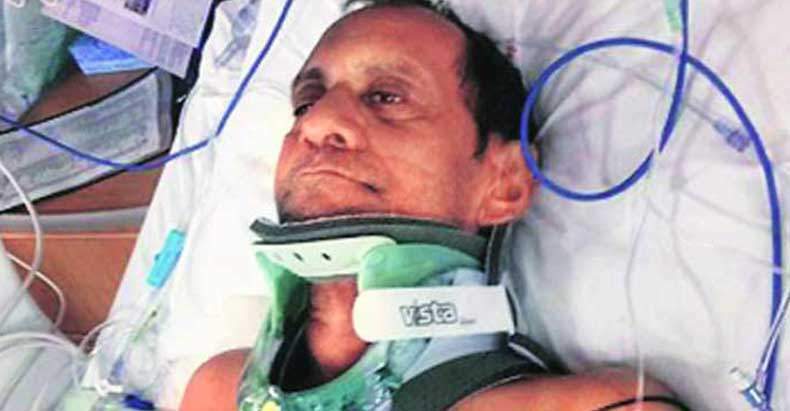 Huntsville, AL – After a jury failed to reach a decision in the federal trial of an Alabama police officer, which left an Indian grandfather partially paralyzed, the judge declared a mistrial in the case. The surprising announcement by U.S. District Court Judge Madeline Haikala came after jurors told the judge on four separate occasions that they were unable come to a unanimous decision. Officer Eric Parker is accused of using excessive force while violating the civil rights of a man from India. Parker was caught on video violently slamming 58-year-old, Sureshbhai Patel to the ground in early February 2015. This left Patel with severe injuries, including partial paralysis. Patel, who was in the U.S. visiting relatives, was approached by officer Eric Parker as he was taking a morning walk. The incident began after a paranoid neighbor reported a “suspicious” thin black man walking through the neighborhood. Parker was subsequently arrested for assault after the brutal encounter with Patel, which was caught on dash camera. When the incident became public, it sparked international outrage. The Indian man had only recently come to the United States to assist in caring for his grandson, and spoke no English. The condemnation went so far as to force Alabama Gov. Robert Bentley (R) to formally apologized to the Indian government. A grand jury indicted Parker in March on one count of felony use of unreasonable force. During the trial, the defense attempted to portray Parker as a scared officer simply reacting to the actions of Patel, claiming that the officer escalated his use of force commensurate to the victim. Parker incredulously claimed that he simply lost his balance as he took the grandfather to the ground, which he did because he feared for his safety as Patel reached into his pockets and pulled away from him. The failure of the jury to decide that Parker’s actions were criminal shows a level of indoctrination into a level of authoritarian control that baffles the mind. The video clearly shows this cop approach a man who speaks no English and escalate the situation into a violent encounter that left a man partially paralyzed. The idea that this behavior was anything less than criminal shows either an extreme ignorance of what conduct is legally acceptable for a cop, or a blatant disregard for Patel’s civil rights, most likely for having a darker complexion in Alabama. Hopefully, the next jury holds Parker accountable for his thuggish behavior captured in this brutal video.